SOAP XML web service, and client app. Hosted on Azure. Updated content, with some hints and helpful information, has been added, in blue text. If you wish to submit the lab before the due date and time, you can do that. Yes, your project can earn part marks if a feature is missing. Create a legacy SOAP XML web service. Create a client that works with the web service. In the USA and Canada, Black Friday has captured the attention of many in our society. Therefore, we need a web service that models this curious aspect of pop culture. The web service will be based on legacy SOAP XML technologies. It will enable a caller to create a sales order, among other tasks (e.g. 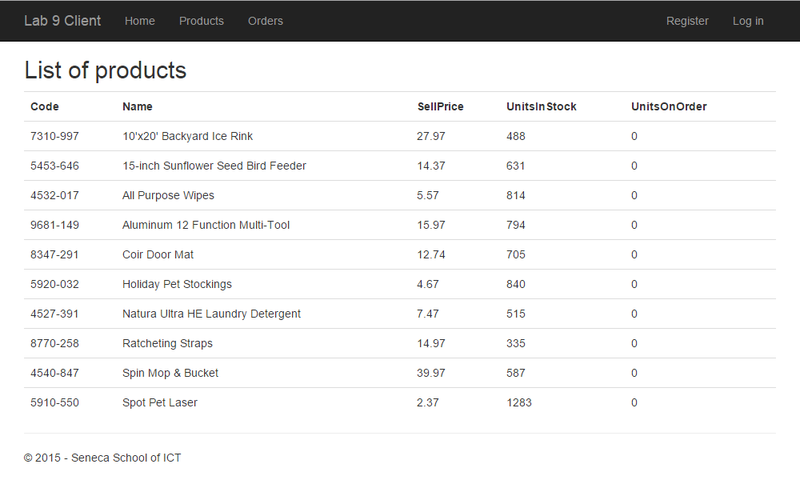 get a list of available products, and display an existing sales order). A client app, as a separate project, will interact with the web service. Your work will be hosted publicly on Microsoft Azure Services. Do you need to implement security? Create a new project, using the “Web API project v3” template, named Lab9Service. Create a separate new project, using the familiar ASP.NET MVC web app template, named Lab9Client. The “Authentication” setting doesn’t matter. We will have a simple Product class. A separate class will hold a SalesOrder, which is related (to-many) with an OrderItem class. An OrderItem object has a required association with a SalesOrder object. Add a WCF Service named “OrderService” to the project. As you have learned, its interface defines the supported or expected operations. In the interface source code file, add method declarations for the operations that will support the use cases. Pay attention to parameters and return types. Continue to follow the rules that you have learned: Accept and deliver resource model objects and collections. Do not leak information about the design model to callers. As you work on the remaining tasks, test your work frequently, using the WCF Test Client. Programmatically, add some starter data for the Product entity. Ensure that this process runs only once. There are many ways of doing that. Ask if you need a reminder. Think of something product-like in your life that you like. Create ten (10) products. Please set the initial value of the UnitsInStock property to a number in the hundreds, so that there are enough Product items available as you test your app’s logic. The service will deliver a collection of Product objects. Well, actually it will deliver a collection of resource model objects. Like a controller, the service will call a repository method, which will actually do the work. Therefore, complete and test the code that enables the delivery of a collection of product objects. Hint: While you are writing code in the product repository, add another method that will get one product by its identifier. This method will be needed later, when adding a new sales order, and validating the existence of a product. The service will deliver a collection of SalesOrder objects, using a resource model class. Should the resource model class include a collection of OrderItem objects? It doesn’t matter (for grading purposes). If your resource model does include the collection, then it can be used for this “get all” use case, and the “get one” use case that follows. 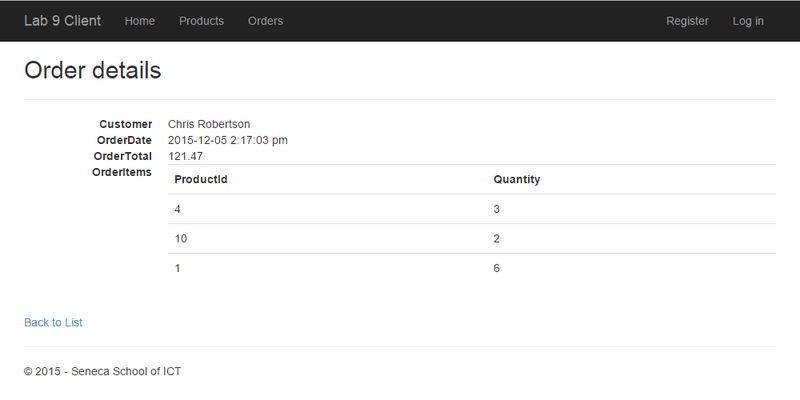 Then, you can still decide whether you fetch the associated OrderItem objects when you fetch the SalesOrder objects. If you do, they come along. If not, the collection’s value will be null for each item in the “get all” use case. That’s OK. Remember, we’re focusing on SOAP XML web service competence in this assignment, and we’re not trying to precisely model the real world with a production-ready app. The service will deliver a specific SalesOrder object, using a resource model class. Include its collection of OrderItem objects (obviously using a resource model class). The service will accept a package of data, and create some objects in the data store. What does the package of data look like? Well, think about any experience that you have had in a retail store. For example, Peter visits the Canadian Tire store, and selects two hammers and one screwdriver. That’s the data package – the sales order customer is “Peter”, and the two order items are hammers (quantity 2) and screwdriver (quantity 1). While processing the transaction, all the missing pieces of data are filled in (date, price, etc.). The result of this task will be to return a fully-configured sales order object (that includes a collection of order items). 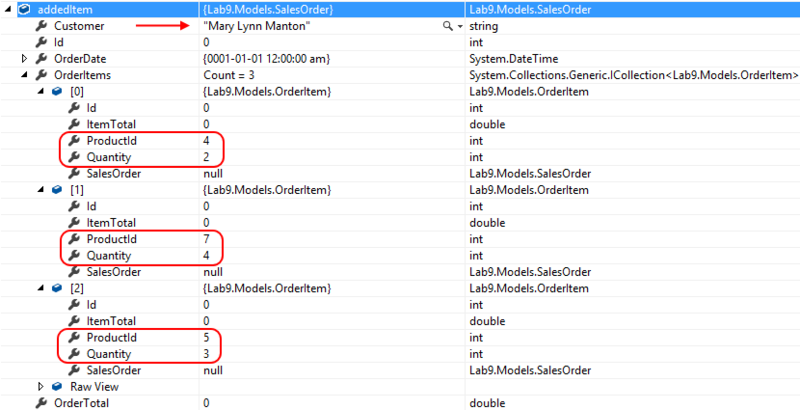 Create a sales order object, based on the incoming data. When the data comes in, it will get mapped on to a SalesOrder object. Some properties will have data (Customer, OrderItems), but many properties will be empty, until they get filled in. Click the image to see the SalesOrder object at this point in time. Fill in the date-and-time value. 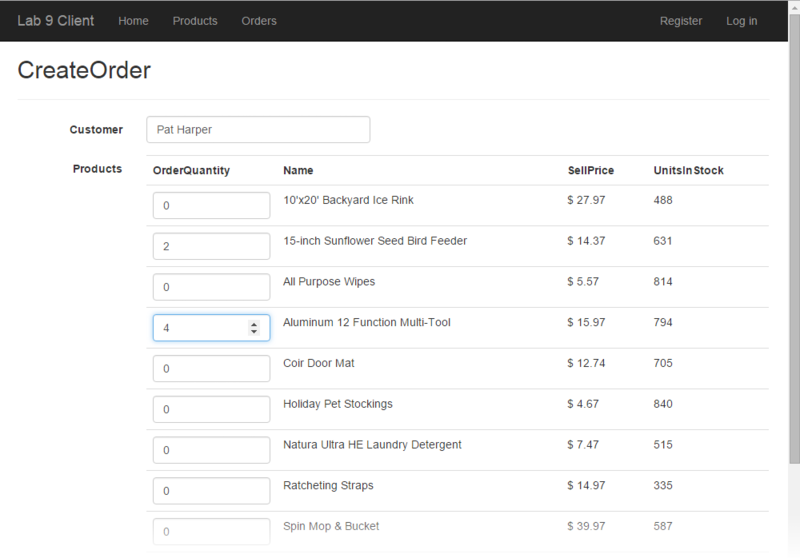 Create an “order total” accumulator, which gets updated when processing each order item. BEFORE starting the work on the client app, ensure that the web service works correctly. All four use cases. Use the WCF Test Client to ensure that it’s working. Then, you can begin work on the client app. One of the first tasks is to add a service reference to the project. Names are important. The “Namespace” name will be used in your code to enclose the generated proxy classes, and enable access to the service class. Therefore, make it meaningful and clear. In the “Add Service Reference” dialog, open the Advanced configuration dialog, and clear (un-check) the “Reuse types in referenced assemblies” checkbox. Visual Studio will generate some code. It creates classes that act as a local proxy to the remote web service. As you have learned when creating ASP.NET MVC web apps, you should create a Manager class (in the Controllers folder). The Manager code will know how to contact the web service, and handle the request and response messages. Keep it simple. Use view scaffolding when possible. In the views, ensure that Bootstrap classes are used for all HTML Form elements. Hint: Are you looking for some help with the “add new” sales order task? Look at the Appendix to this Lab 9 specification, below. If you make a change to the web service’s methods or resource models, the changes affect how client apps can use the web service. Therefore, if you do change the web service, you must “update” the service reference in the client app. Locate the service references folder in Solution Explorer, right-click the service, and choose “Update Service Reference”. Having problems deploying to or running on Azure? Check this document. At a minimum, your Lab9Service will be deployed to Azure. Then, in your client app, you must update the service reference, by pointing to the Azure-deployed web service. Then, test your client app again, to ensure that it still works. If that works well, then you can deploy your client app to Azure. Deploy your Lab 9 service to this endpoint. Before continuing, use the WCF Test Client to interact with the service. Test the client app, to ensure that it works with the Azure-deployed web service. You can now deploy your Lab 9 client app to this endpoint. Use the WCF Test Client, and your client app. If you need more details, look at the info in assignments 1 through 4. It would be nice to create an HTML Form that was easy and safe to use. If you need help with this task, your professor can help by providing some guidance from his sample solution. Create the view to support the “add new” task. Use scaffolding, and specify the sales order add form class, so that it generates the view code. At this point in time, it will add code only for the “Customer” property. Remember (from your web apps programming course experience) that collections are NOT automatically code-generated. We must do that part ourselves. Normally, we would use a view model, and model state validation to process the incoming data. For this situation, we will NOT do that. We will process the incoming data as an untyped collection of form data items. Therefore, the method argument type is FormCollection, which is a collection of key-value pairs. // Process only the key-value pairs that begin with "item"
As shown above, we created a custom view model, “SalesOrder”. It will not be automatically handled by the web service “add sales order” method, because the web service is expecting a “SalesOrderAdd” object. Therefore, in the Manager method, you must map the local SalesOrder object to a web service SalesOrderAdd object. Use AutoMapper. Create maps for both the sales order, and the order item. Click on each to open it full-size in its own tab/window.